I’ve been painting. Again. The result—considering it took me three hours to produce—is mildly disappointing. The process, however, delighted if not myself, then my cat. She was excited by the opportunity to chase around brushes, sniff paint and step (literally) in the work in progress. 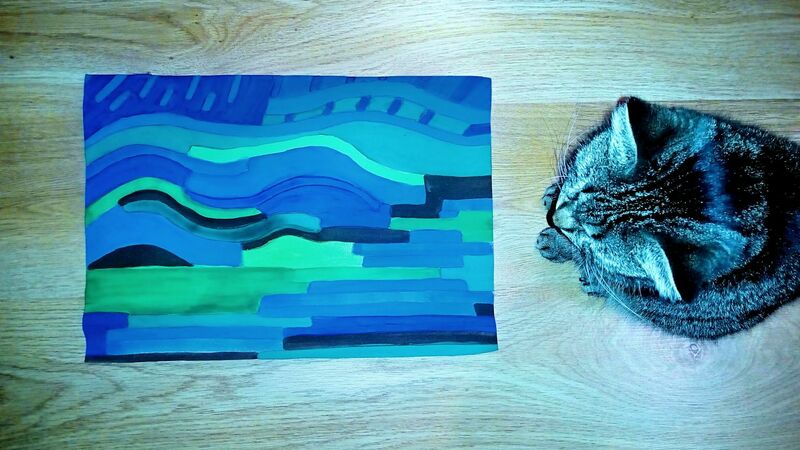 I’ve discovered that the cat finds cobalt blue soothing but fiercely hates dark green. I had some trouble defending the brush from her when applying dark green. Also, in case you wonder, once you have a cat, you never do anything without involving the cat. The cat involves herself. Oh my gosh, I love this. This is so cool. I have been painting and drawing again as well, all for the process not concerned with the result. It is soooo calming. But the addition of your cat is awesome just as company, and then to find she is not only interested but has her own opinions is just fantastic! Thanks for sharing. Ooh, thank you so much for your lovely feedback! I’m so glad that I made myself be creative again, it’s good to take a little break from the computer and train your motorics with the brush. Ah, for more time, today! I shall name my picture in honour of your poem “The Mouse Maze Map”. Love the alliteration too! Very true. Cats really do love to “help” with everything. I really like it! I like the colour choices and the variation in line shape. I love that you are enjoying painting. Oh dear, that’s a much kinder feedback than my experiment with painting deserves! I love it that I made myself resume some creative work, no matter the results. My cat Sylvester approves this post. He also likes to “help” me with my various projects usually interjecting himself into my lap while I’m trying to write. If Sylvester was able he would follow my outside while I pursue my photography passion but thankfully he is a homebody. Love your art and your kitty!! Meow!! My cat could pass as a critic of anything. She’s natural at giving judging looks.